Go all day with the lightweight, comfortable Fastpack 350 backpack. 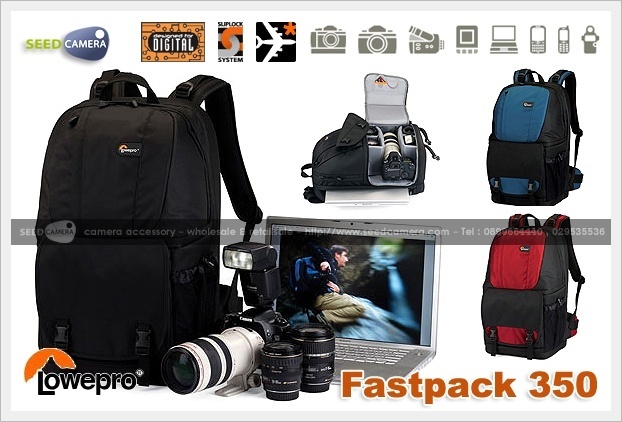 It protects your pro digital SLR and 17" widescreen notebook compactly while providing generous storage for other gear. Side-entry compartments let you quickly grab equipment and accessories, even while you're on the move. Customize the easy-to-access main compartment with adjustable dividers. A comfortable mesh waistbelt, and an adjustable sternum strap, help distribute weight evenly. To help you make the most of this Lowepro bag take a look at our new product video.